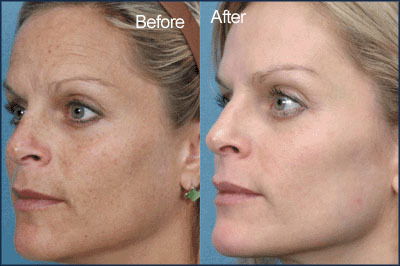 Safely restore youthful healthy looking skin! Painless, fast and easy way to treat sun damage, age spots, mild wrinkling, vascular/pigmented lesions, and rosacea, giving skin a younger more luminous quality. 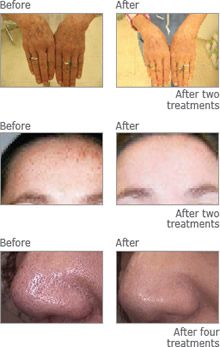 For dramatic improvment in skin texture, discoloration, redness, broken capillaries, sun damage, and acne. Multiple session required for optimal results. This unique technology can offer superior results with the highest levels of comfort and safety for face, neck, & chest. These conditions are treated simultaneously with each session. Treatments can take as little as 20 to 30 minutes with you returning to work or play immediately. A series of treatments are recommended for natural improvement and long-term results. Cooling of the skin surface ensures additional safety during treatment. This is a no-downtime procedure. Many patients return to normal activities immediately after treatment.